Tomato soup is my favourite, and I really wanted to try making it on my own and happened to have some bell peppers in the fridge that needed to be used, so it became a tomato & roasted pepper soup. The version I made is creamy, but this recipe works great without the cream factor as well. You can definitely used canned tomatoes, but if you choose to use fresh don’t forget to score them as it makes it easier to peel the skin off. 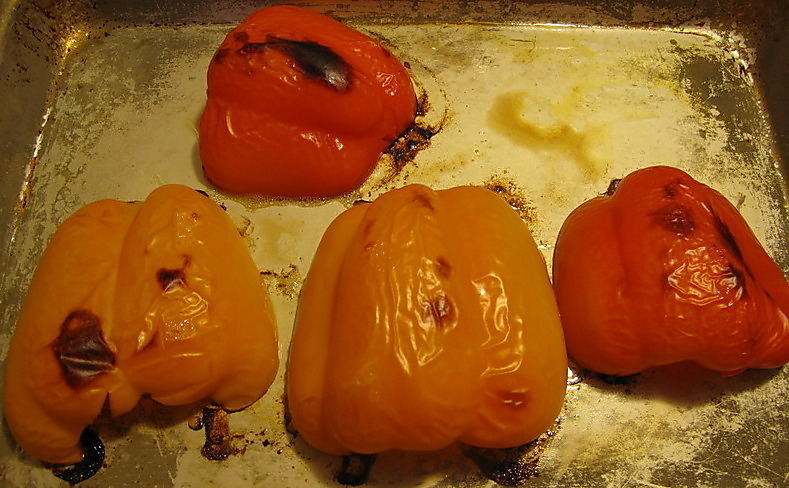 When roasting the peppers what you are looking for is the tops to char a little and the skin to bubble and pucker, so that it will slide off nice and easy. You can garnish it with whatever you please (sour cream, parsley etc.). I choose croutons. 1. Cut peppers in half and remove core and seeds. Place on a pan and put in an oven set to broil. Broil the peppers until the tops have charred and skins have bubbled up. Place the peppers into a ziploc for about 10 minutes and once you removed them from the bag the skins should just slide right off. Chop up and set aside. 2. 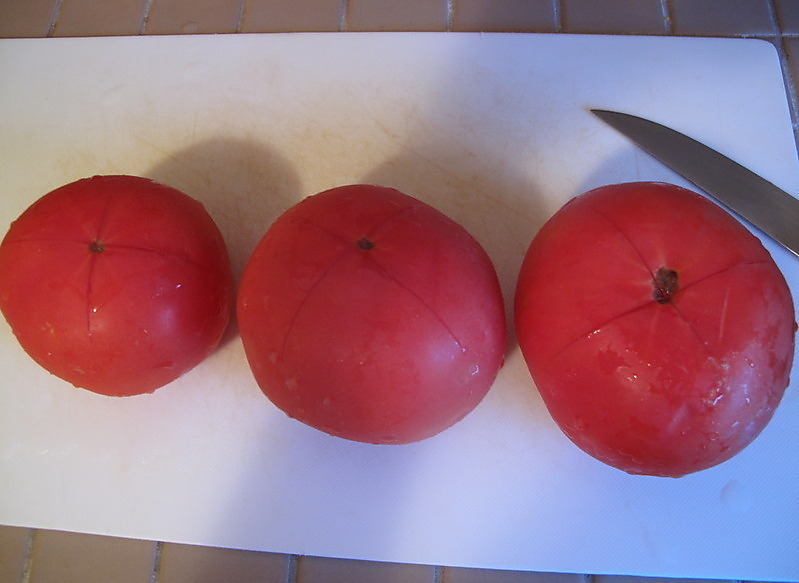 Score tomatoes and place into a pot of boiling water for about 1 minute. Remove and put into a bowl of ice cold water for a few minutes. Remove and peel skins off. Chop up and set aside. 3. In a large saucepan add olive oil, chopped onion and minced garlic. Cook over med-low heat until onions become translucent. 4. Add peppers and tomatoes into saucepan and continue to cook over med-low heat for about 10 minutes. Then add mixture to food processor (just do bit by bit) and pulse until mixture is the desired texture you would like for your soup. 5. In a large pot combine tomato/pepper mixture, chicken stock, basil, chili powder, chili pepper flakes, salt and pepper. Bring to a boil and then turn down heat and simmer for about 25 minutes. 6. Stir in yogurt and cook for about 5 minutes more. Add salt and pepper as needed. 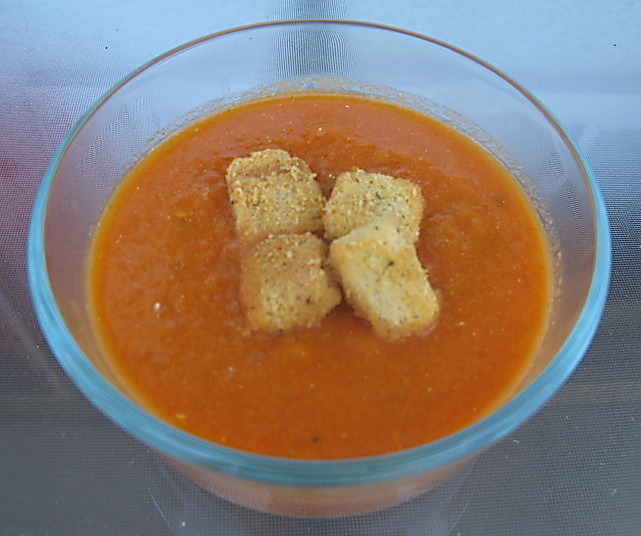 This entry was posted in Soup, Vegetables and tagged cooking, from scratch, Recipes, roasted pepper, soup, tomato by Karina. Bookmark the permalink.